Seattle-based startup Play Impossible has inked a retail deal with Apple for its smart inflatable "Gameball" that encourages people to play both single player and multiplayer games through a connected iOS and tvOS app (via GeekWire). 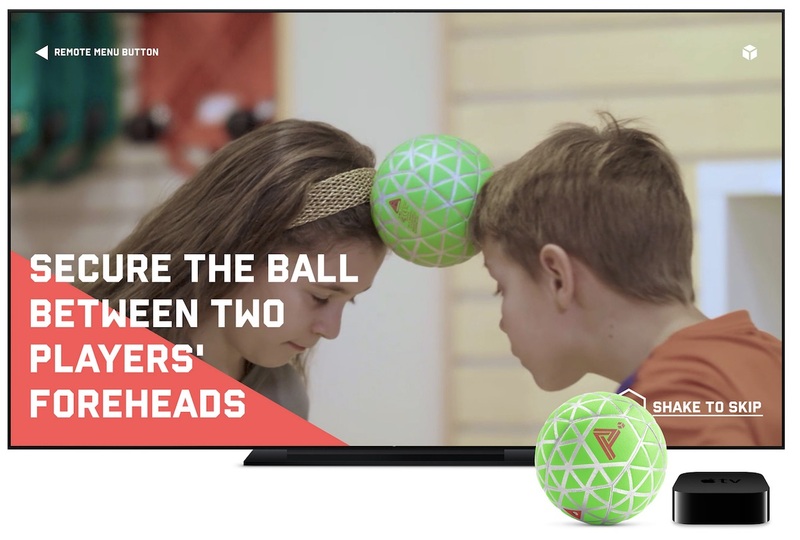 The Gameball connects to iPhone, iPod, iPad, or Apple TV through Bluetooth, and games emphasize hand-eye coordination, agility, and creative thinking, according to the company. Games include "Splash," a virtual water balloon toss game where you have to keep the Gameball in the air longer by catching it as softly as possible since handling it roughly will result in a "popped" balloon. There's also "Jostle," a play on a game of keep away where you have to try to keep the Gameball as still as possible while friends attempt to make it move. There are versions of Hot Potato and a volleyball-like "Rally," all aimed at ages 9 years and older. The device includes games related to STEM as well, encouraging younger players to grasp how physics plays into sports by keeping track of airtime, height, speed, or catch force in games like "Skyscraper" and "Sports Lab." Additionally, Gameball's session data can be exported from the iOS app to spreadsheet software for classroom activities. Gameball records airtime as experience points every time you play a game, building into each user's own level system and achievements that are available to unlock. Experience can be gathered through playing the device's games or completing daily missions discoverable through the connected app. Gameball sells for $99.95 in Green and Purple on Apple.com. The device supports play sessions that last for up to 2 hours, and an included Rapid Charger refuels the Gameball in approximately 20 seconds. Ever wonder if technology is going backwards? Why would you pay $100 for a ball that you have to charge up instead of just playing with a ball? This seems kind of silly. Kids don't need to make a ball to be electronic. All the games listed can be played with a ball that costs $1 and depends on the kids imagination. Would you pay $100 for a ball and app that invokes, excites, and continually encourages your overweight kid to play and play with and make new friends while improving their physical fitness? Or would you like to spend countless hours and medical bills over the life of your child(ren) to the tune of $10s of thousands of dollars due to medical bills and mental illness such as depression? Yes I know depression can happen on a dime for ANYONE! Bud, kids have been playing with toys and making friends since forever. A $100 ball and app are not a panacea. A $1 ball can engage a child equally as well. Signing. The word is signing. We don't need a new word 'inking'. The Rolling Stones were never 'inked' to Beggars Banquet. That will be great for spreading lice! Smart Balls. Whatever next. The world's gone mad. Virtual water balloons. Analyzing statistics of game play. Talk about ruining a kids fun.